The Northern Irishman's second yellow card against Alloa has been rescinded. St Mirren midfielder Brad Lyons' second yellow card for simulation on his debut against Alloa has been rescinded. The Northern Irishman was cautioned for dangerous play and then sent off by referee Don Robertson in the 28th minute of the Scottish Cup tie when he went down under pressure from Alloa skipper Andy Graham. However, the Scottish FA has now rescinded the Blackburn loanee's second booking following a successful appeal by the Buddies. 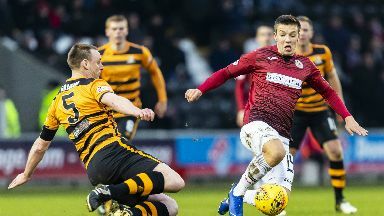 Ten-man St Mirren fought back from 2-0 down to beat Alloa 3-2, with Lyons now available for selection for the fifth-round tie against Dundee United. The 21-year-old played under Oran Kearney at Coleraine before linking up again with his compatriot in Paisley. St Mirren visit champions Celtic on Wednesday as they resume their league campaign and look to stave off the threat of relegation.